There are too many trees in Sierra Nevada forests, say scientists affiliated with the National Science Foundation (NSF) Southern Sierra Critical Zone Observatory (CZO). That may come as a surprise to those who see dense, verdant forests as signs of a healthy environment. After all, green is good, right? Not necessarily. When it comes to the number of trees in California forests, bigger isn't always better. That's in part because trees use lots of water to carry out basic biological tasks. In addition, they act as forest steam stacks, raking up water stored in the ground and expelling it as vapor into the atmosphere, where it's accessible to humans and forest ecosystems only when it falls back to Earth as rain and snow. That process -- by which plants emit water through tiny pores in their leaves -- is known as evapotranspiration. And according to researchers, excessive evapotranspiration may harm a fragile California water system, especially during prolonged, warm droughts. New research published this week in the journal Ecohydrology shows that water loss from evapotranspiration has decreased significantly over the past three decades. That's due in large part to wildfire-driven forest thinning -- a finding with important implications for forest and water management. A century of forest management had kept wildfires to a minimum. But without fire, Sierra forests grew very dense. In recent decades, new policies have allowed nature to take its course, with wildfires helping to thin out overgrown forests. "Forest wildfires are often considered disasters," said Richard Yuretich, director of NSF's CZO program, which funded the research. 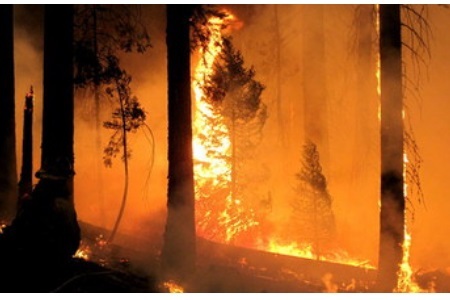 "But fire is part of healthy forest ecosystems. By thinning out trees, fires can reduce water stress in forests and ease water shortages during droughts. And by reducing the water used by plants, more rainfall flows into rivers and accumulates in groundwater." Using data from CZO measurement towers and U.S. Geological Survey satellites, researchers found that over the period 1990 to 2008, fire-thinned forests saved 3.7 billion gallons of water annually in California's Kings River Basin and a whopping 17 billion gallons of water annually in the American River Basin -- water that would otherwise have been lost through evapotranspiration. "The need for forest restoration is being driven largely by the need to lower the risk of high-intensity wildfires and restore forest health," said University of California Merced scientist Roger Bales, director of the Southern Sierra CZO and study co-author. "Downstream users who benefit from the increased water yield are an important potential revenue stream that can help offset some of the costs of restoration." Forested areas needing restoration are large, Bales said, but potential changes in water availability are significant. The total effect of wildfires over a 20-year period suggests that forest thinning could increase water flow from Sierra Nevada watersheds by as much as 10 percent. The U.S. Forest Service says that 6 to 8 of the 21-million acres it manages in California need immediate restoration. Another 58 million acres nationally also require restoration. For California alone, restoration costs are estimated at $5 to $10B. But, according to the study authors, the restoration might help pay for itself. "We've known for some time that managed forest fires are the only way to restore the majority of overstocked western forests and reduce the risk of catastrophic fires," said James Roche, a National Park Service hydrologist and lead author of the new study. "We can now add the potential benefit of increased water yield from these watersheds."